Why develop your own project pipelines when you can just buy them? That seems to be a strategy among large solar electric equipment manufacturers such as Sharp, which announced Tuesday its plan to buy Recurrent Energy for about $305 million in cash. Sharp said the purchase will net it 2 gigawatts of projects under development, including 330 megawatts that are under contract for delivery. The Japanese company’s move seems reminiscent of the decision by First Solar (s FSLR) to spend $400 million to buy OptiSolar’s project pipeline in 2009. 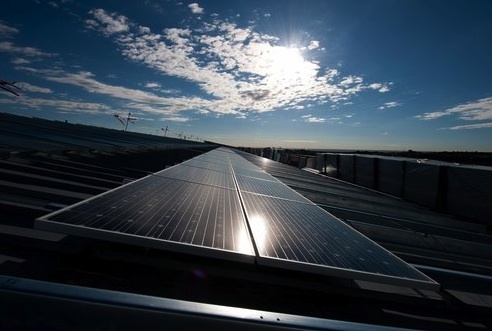 The acquisition made First Solar a formidable player in the project development business and gave an outlet for First Solar’s cadmium-telluride solar panels. But Recurrent’s CEO, Arno Harris, said his deal with Sharp is much different than the First Solar/Optisolar deal. For example, the San Francisco-based Recurrent Energy will retain its name and executives and staff, said Harris during a press conference call, unlike how OptiSolar was essentially swallowed up by First Solar. “We are really spreading our wings with strategic support from Sharp,” Harris said. Although Sharp will own Recurrent, its agreement doesn’t require Recurrent to use Sharp’s solar panels, Harris said. What Recurrent will get mostly from Sharp is the Japanese tech giant’s financial support and brand name recognition. He expects Recurrent to continue its relationship with its suppliers. Recurrent has inked purchase deals with Suntech Power, Yingli Green Energy and SolarWorld in the past. Buying solar panels from Sharp can make good business sense for Recurrent, however. Sharp is one of the largest solar panel makers in the world, so it has the manufacturing might to offer cut-rate products to Recurrent. Sharp makes crystalline silicon solar panels, just like Suntech, Yingli and SolarWorld. Sharp also has been beefing up the production of panels with thin layers of amorphous-silicon/microcrystalline silicon. Recurrent has been in the business of developing and owning solar energy projects and selling the solar electricity to utilities or business customers. The company will continue with this approach but also will consider selling projects after they’ve been built if doing so will yield a greater return on the investments for Sharp, Harris said. Harris declined to say how much private equity Recurrent has raised since its inception in 2006. It did announce a $75 million round in 2008 and counts Hudson Clean Energy Partners and Mohr Davidow Ventures among its key investors. Recurrent has found more success in signing energy delivery contracts in North America. Among the 330 megawatts that are under contract, 170 megawatts are going to Ontario Power Authority, 60 megawatts to Sacramento Municipal Utility District and 50 megawatts to Southern California Edison. Recurrent hasn’t developed all of the 2-gigawatt pipeline by itself. Back in 2009, Recurrent bought 350 megawatts worth of project under development from Chicago-based UPC Solar. Congratulations to everyone involved – Sharp, Recurrent and investors Hudson & Mohr Davidow. The lack of exclusivity isn’t necessarily a surprise. Sharp gets valuable downstream market insight, including on products from other suppliers. Recurrent might have to cut back business in the near term if forced to exclusively sell Sharp. Moreover, certain market commitments, like those in Ontario (where Domestic Content is a factor) likely cannot be satisfied – or only partially satisfied – by Sharp. Allowing Recurrent to continue on its current trajectory, and work more closely over the longer term makes good business sense.